U.S. U-19 MNT will play in Slovakia Cup Apr. 20-29. 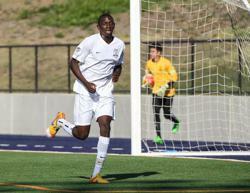 SACRAMENTO, Calif. (April 15, 2016) –Sacramento Republic FC U-17/18 Academy defender Nabilai Kibunguchy has been named to the U.S. U-19 Men’s National Team. Kibunguchy is one of 20 players that will travel to compete in the upcoming Slovakia Cup, which runs Apr. 20-29. Kibunguchy is the third Republic FC Academy player to-date to receive a call-up to a national team camp or team during their inaugural season. U-17/18 Academy defender David Burns and U-15/16 Academy goalkeeper Mason Finnell previously received U.S. national team call-ups. An Elk Grove native and senior at Cosumnes Oaks High School, Kibunguchy has been a key player for Sacramento Republic FC’s U-17/18 Academy team (15-5-5, 50 pts). The team currently sits in second place in the U.S. Soccer Development Academy’s Northwest Division and is currently in a playoff position. Kibunguchy has appeared in 23 of the U-17/18 team’s 25 matches, including 22 starts. He also scored a goal in the team’s 4-2 win against Santa Cruz Breakers Academy U-17/18 team on Saturday, Sept. 26, 2015. Kibunguchy signed a letter of intent to play at UC Davis beginning Fall 2016. The U.S. U-19 MNT will begin play in the Slovakia Cup on Monday, Apr. 25, when they take on Georgia in Modranka, Ukraine. The U-19’s will also take on Ukraine and Slovakia in Group B of the Cup with the winner of the group playing for the cup on Apr. 29. For more information on the U.S. U-19 Men’s National Team visit USSoccer.com. For more information on the Republic FC Academy visit SacRepublicFC.com.